University housing will not be available for all 1,618 students in the Class of 2020 for its last year at Quinnipiac. An email was sent to the class on Tuesday, Oct. 16 regarding the senior housing selection process. The Quinnipiac housing selection process is usually stressful for the student body, and with this email, things have appeared to stir even more tension within the current junior class. This information has concerned junior nursing major Emily Chmura. She said that although she has no intention of living in on-campus housing next year, she feels sympathetic toward those who do. Junior graphic and interactive design major Sarah Vandevaart said that the university seems to be more concerned with accepting new students than accommodating the current ones it has. In spite of the email saying that not all rising seniors are guaranteed housing, Director of Residential Life Mark DeVilbiss said the university has never had to turn anyone away from housing in previous years. DeVilbiss hopes that juniors will not be worried about the senior housing email because he said that regardless of what housing they end up getting, each housing option has its own set of benefits. 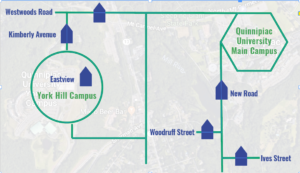 The following university owned housing options available to the Class of 2020 are Eastview, which is located on the York Hill campus and university-owned houses on New Road, Lucien Drive, Ives Street, Kimberly Avenue, Woodruff Street and Westwoods Road. There will also be new housing options made available off campus, according to the email. DeVilbiss said seniors will have an even greater ability to develop individuality by living off campus. Students should be reminded there are still residential assistants for the senior area who facilitate programs and other activities, as well as provide support for their residents as needed. DeVilbiss said that in case a student is unable to receive the housing they want, the university does its best to assist them. The main point that DeVilbiss wants to make is there has always been enough housing for all of the students who wanted housing from the university. The only way that students will not have housing available to them is if every single rising senior wanted university housing. In order to participate in the senior housing selection process, juniors must pay a $500 housing deposit and agree to the senior housing contact by Nov. 4.